With the weather getting warmer, around my kitchen that means dishes are getting lighter. 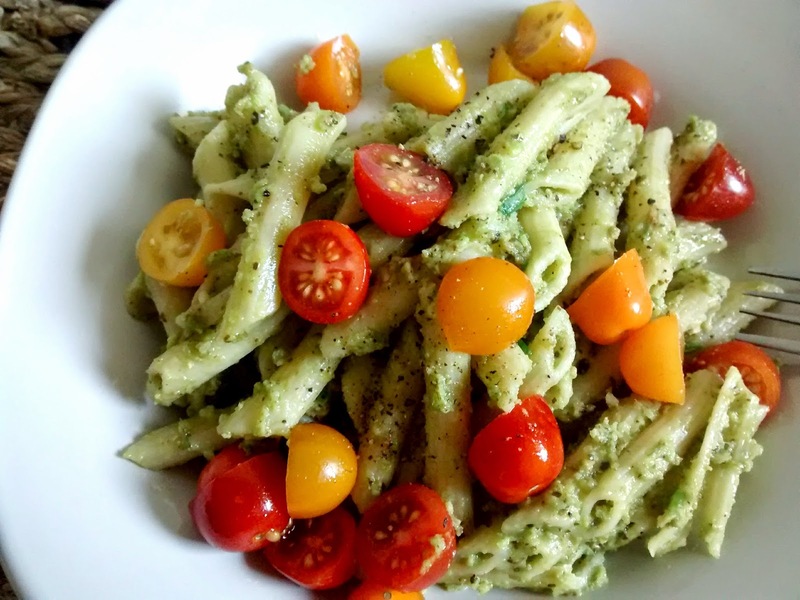 Pasta dishes can sometimes come off as heavy depending on the ingredients used, but pasta salads are a perfect addition to any Spring or Summer time menu. 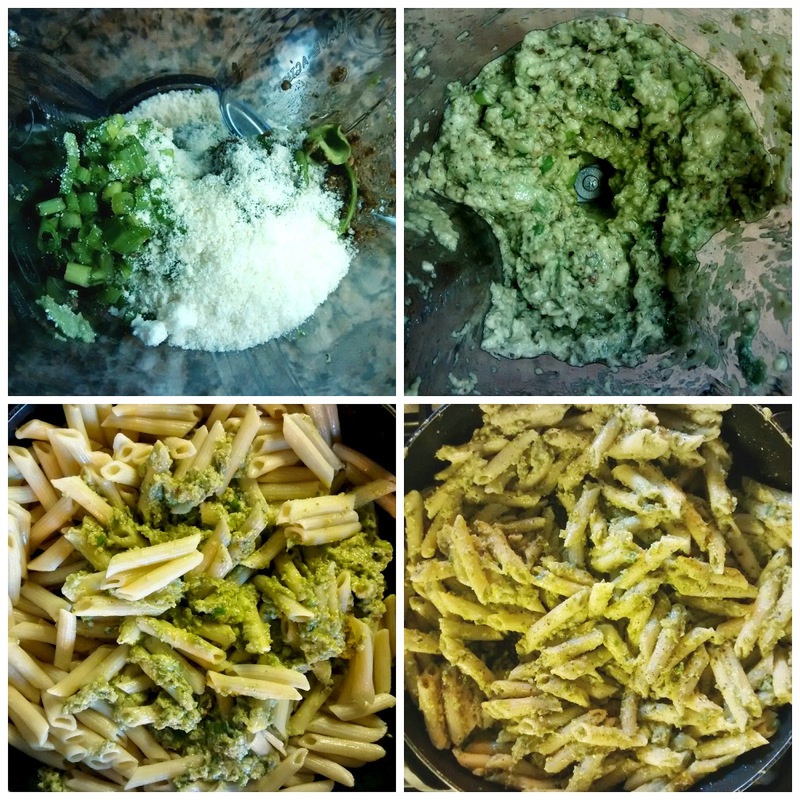 This cheese, garlic and pesto avocado pasta dish is light, easy to prepare, and uses only simple ingredients. What's even better is that it can be served as a warm main dish or as a cold pasta salad side dish. It's a real favorite around here. 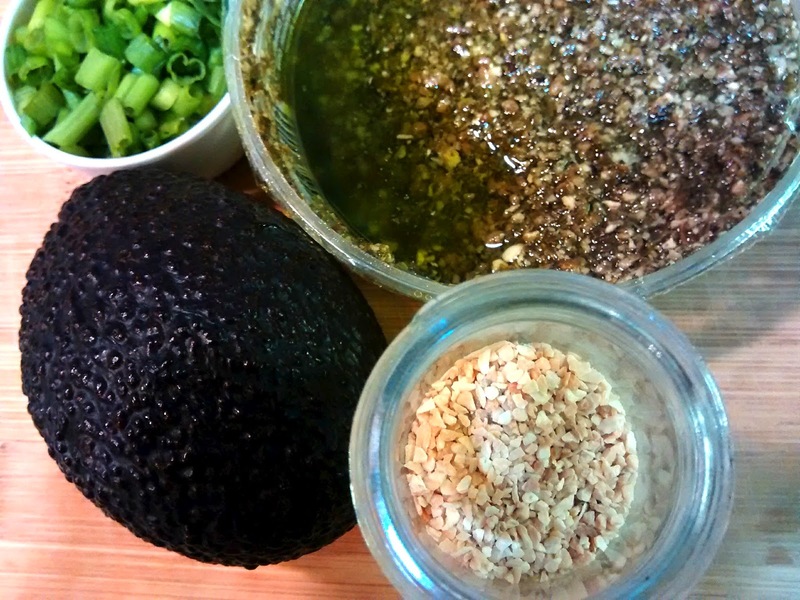 Using a blender or food processor, blend avocados, chives, garlic, pesto, parmesan and olive oil. Blend until the mixture is a thick, smooth consistency. There may be some small chunks. In a large skillet, heat 2 tbsp olive oil. Add 3/4 cook pasta and heat. Stir in avocado mixture, combine with pasta and heat on medium setting for about 5 minutes, stir frequently. Instead of heating, add avocado mixture and tomatoes to cooked pasta and chill for 30 minutes. Sounds delicious think I may make this tonight! I love pesto. This looks yummy. I never would have through of adding avocado! This looks delicious! Oh my GOSH. i LOVE avocados!!!!!!! This looks SO tasty (and healthy)!! I'm going to make this asap! What a great spring and summer recipe. I'm tired of the same old pasta salad that I make. This will be a nice addition to our menu this week! This looks so good. I have never cooked with avocado before. I have used it sliced on my fried egg in the AM or diced on a salad. I have used it as a sandwich spread and of course guac. I will have to try this! This looks amazing!! Pinning to try this later. Thanks for sharing!! I need to try this. I love avocados. Looks super tasty! OMG this looks amazing! I'm a sucker for pasta dishes! Can't wait to try this one out! I love fresh and easy recipes like this--what a great combination. Thanks for the recipe! This looks absolutely yummy! Perfect for a picnic on the beach! I am always trying to think of lunch ideas other than sandwiches and this is exactly what I was looking for! Thanks for the recipe! I love pesto and I love avocado. Can't wait to try this. Wow, this recipe seems so rich and flavorful. I'm definitely going to try this one. 1. You are adorable. 2. We're Cali girls too! :) and 3. This looks so fresh and delicious! Love everything in this salad! I will have to try it! A pasta dish I would try! Thanks for joining the Thursday Favorite things blog hop! 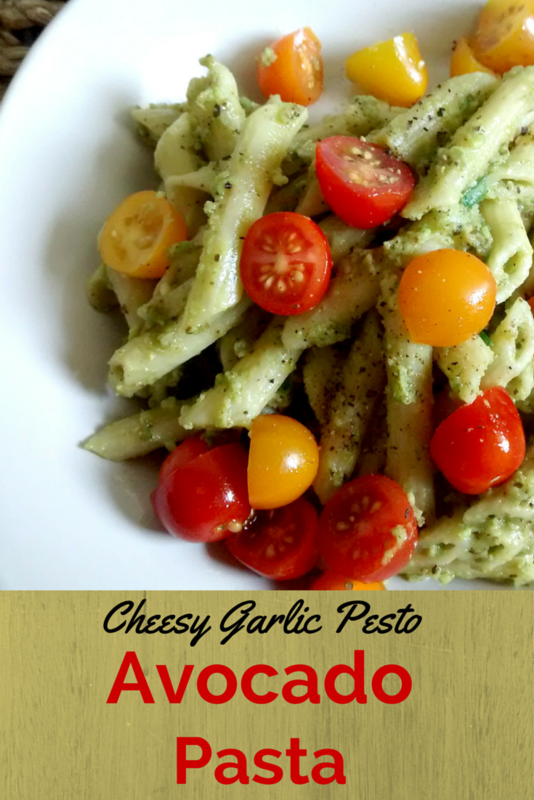 I am so ready for spring recipes like pasta salads, this one with the avocados and garlic sounds wonderful! Going to buy the ingredients TODAY....looks amazing!!!! 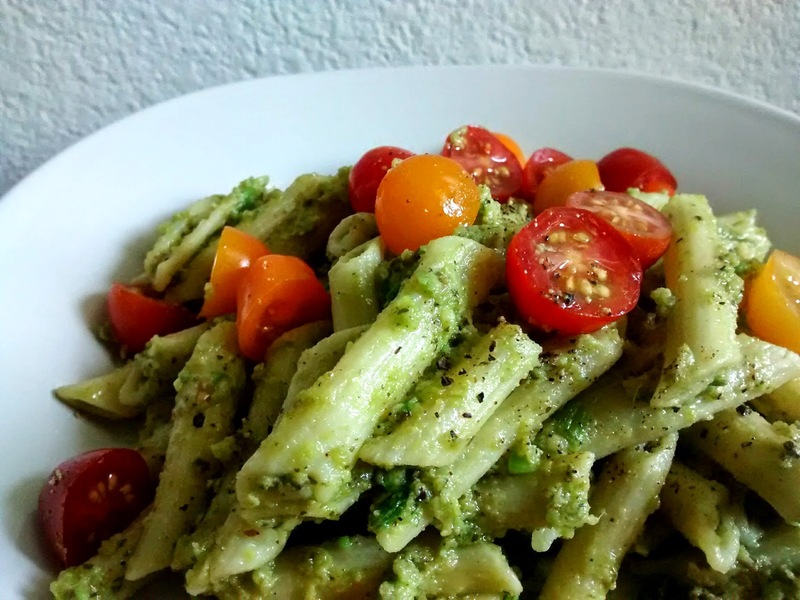 I love anything with Pesto and avocados. This looks fantastic! Definitely making this! Pinned! This looks amazing. We love avocado and I am pinning. This looks amazing. I am pinning to try later!